Our food-themed and cooking team building events are fun and delicious. Each program is the perfect blend of good food, competition, and fun to encourage your group to work together as a team. Ultimately, teams will enjoy each other’s company while cooking up some tasty treats. Best Corporate Events will work seamlessly with your venue to arrange all the logistics from ordering the food to the setting up the room. The kitchen has always been a place where friends and family like to congregate to socialize. Preparing food together can foster creativity and camaraderie which makes cooking a perfect team building activity. Teams will enjoy a competitive format type event while collaborating and strengthening the cohesiveness of their team. As a result, this is a perfect opportunity to level the playing field. Teams can be created by combining various departments to work together. Everyone will take on an important role and it will take each team member’s contribution to create what is on the menu. 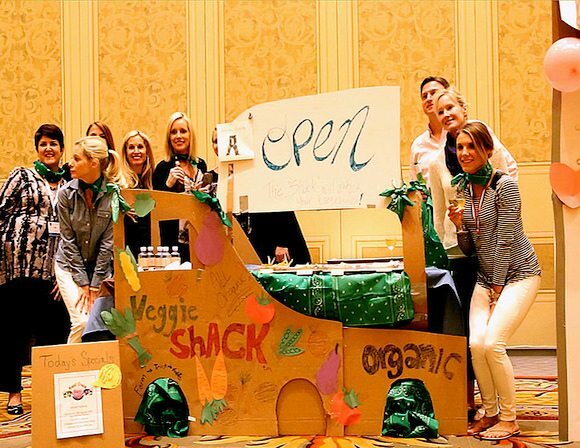 Best Corporate Events offers five food-themed culinary programs. Each designed to allow everyone from a novice cook in their home kitchen to the master chef in a gourmet kitchen to participate comfortably. Several tasks will occur simultaneously. Tasks include prepping and cooking the chili. Also, decorating the head chef’s apron, and creating a presentation or jingle that will showcase the uniqueness of their team. Participants will also earn points for their team using Apple iPads®. The iPads® which deliver text, audio and video clues, chili trivia, and exciting gaming challenges. All your memories of this delicious team building event will be captured with photos and video of your teams in action. After judging, scoring and tasting, one team will emerge as the reigning Chili Cook-Off Champion! Fiest Fun™ is a lively event where corporate groups will experience the sights, sounds, and flavors of Mexico! In this exciting contest, participants compete to make their brand of salsa, guacamole, and golden margaritas! They will be having fun to the beat of Mexican music as the program kicks off with a series of team building icebreakers. Next, teams work on their unique recipes. Followed by developing a name, logo and a jingle to market their creations. Tables are equipped with all the required utensils, and an abundance of ingredients are supplied. Each of these cooking programs shares a common goal. After teams are formed, they will participate in a fun icebreaker which will set the order in which they will choose their cuisine. The order also determines the theme that their food truck will feature. All-American, Mexican, Mediterranean, Asian, Vegetarian, and “Sweet Tooth” are all on the table and up for grabs. Once cuisines are chosen, it’s time to get to work. Teams pick a company name, design a logo, and build a large truck façade with cardboard, duct tape, and decorative materials. Then, teams will create their menus. To whet their colleagues’ appetites, teams will create and present a commercial to promote their menu. This event will test each team’s culinary creativity with specific ingredients will be provided, and suggestions for the dishes to be served, but there will be no actual recipes. Teams will be provided with iPads and a food and beverage budget. They will search for local restaurants, cafes, streets vendors, food trucks, and farmer’s markets in their host city. At each location, teams will sample local cuisine and videotape live critiques on their iPads. This is a one-of-a-kind scavenger hunt. As teams travel on their culinary tour, they will navigate to historical points of interest. Teams will earn points by completing in photo and video challenges. As well as a variety of Foodie themed missions such as Chef Talk, Food Critic, Foodie Trivia and Beat the Bartender. Teams could even earn extra points at fun, challenging, physical game stations set up at one or more of the stops! In this Spanish-themed series of team bonding cooking exercises, your group will be making Tapas and Sangria! Now enjoyed everywhere, Tapas originated as appetizers or small plates in Spanish cuisine. Flavorful Sangria is a beverage from Spain and Portugal, which usually consists of wine, chopped fruit, sweetener, and a small amount of brandy. Your group will be formed into “wineries.” Each team will choose a name for their winery. Here, teams will develop their brand of Sangria using ingredients from our marketplace. Also, they will design a logo used to market their unique concoction. The ingredients in Sangria vary, particularly in the type of fruit used, the kind of spirits added, and the presence or lack of carbonation. Teams also create Tapas based on a delicious cold menu provided. Therefore, no stove required for this cooking event! Ingredients and a dish description will be provided but not a specific recipe. That’s where the team building comes in. The type of cuisines may vary, but these cooking programs share a common goal – to build unity while breaking down barriers for better communication. Culinary programs offer challenges to the group’s creativity, communication, cooperation and time/resource management. Most importantly, culinary team building fosters positive, open communication and resourceful thinking. From a small intimate group of 30 to a large group of 100’s, our events focus on interaction which leads to happier and more productive team members in the workplace. So let’s get cooking!